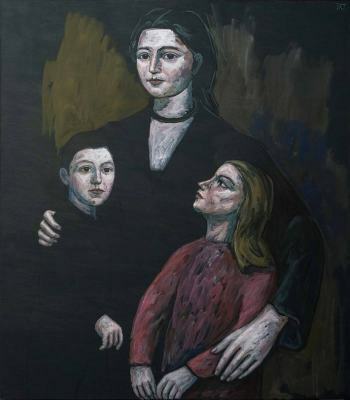 This painting shows a widowed mother with her two young children. The mother is the firm support upon which her young charges lean. The boy is gripped by the mother's right hand, while the continuity of black tones melds his figure with hers. The girl regards her mother with attention and trust, while the mother's left arm wraps around her and the large, maternal hand (in the lower right corner) gathers her in protectively. The angle of the mother's hand and forearm are continued in the forearm and left hand of the girl, whose arms and hands are composed of relaxed curves, as is the right hand of her brother: in both cases the great surrender of these two children to the safety of their mother's arms is absolutely clear.